Kane MacDougal really seems to enjoy his job when things get most difficult. 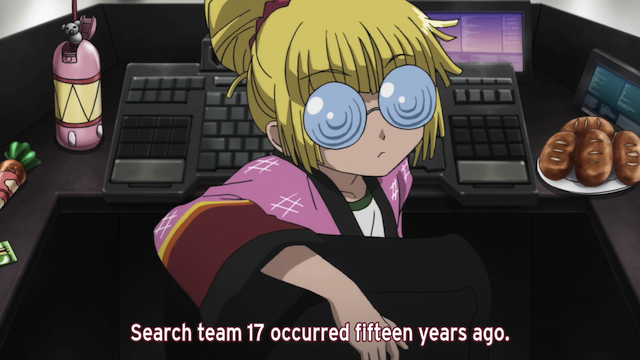 In episode 10 of Mouretsu Pirates (Bodacious Space Pirates) the hunt for the Golden Ghost Ship is on. A number of interesting things were hinted at this week, but the big picture is still unclear. Space pirate ship Bentenmaru attempts to weather the storm. There were a lot of little suggestions throughout this episode. Sometimes they seemed to be hints at plot points, and sometimes they seemed to be showing what the characters are like, and sometimes they just seemed to be providing a detailed demonstration of the setting. It wasn’t always clear, however which was which, and no firm answers were offered by the end of the episode. Chiaki Kurihara: "Silence! 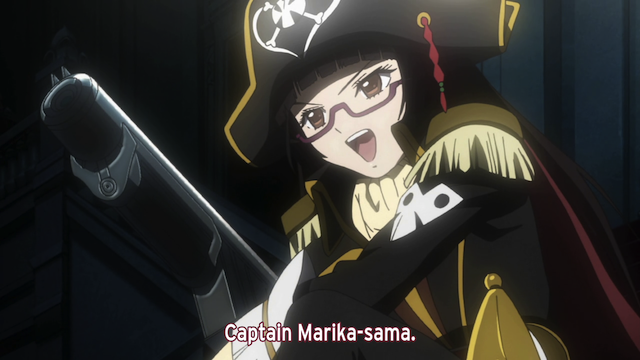 Or do you want to be torn apart by Captain Marika's big guns?" 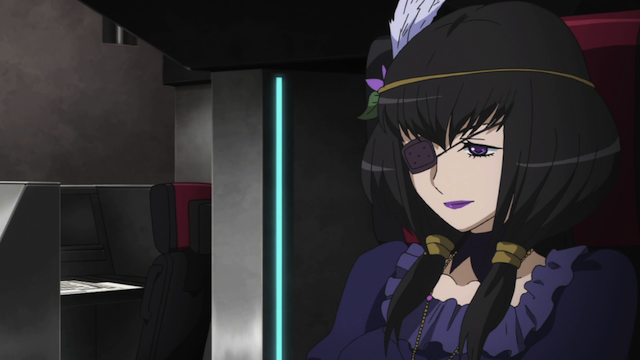 Chiaki is pretending to be Marika, and carrying out the Bentenmaru’s scheduled jobs seemingly with the help of the Barbarossa. This answers a question raised last week — is Chiaki helping Marika with the knowledge of her father? It appears so, although this was never explicitly stated. It was also nice that Chiaki has an opportunity to grow into the captain role a bit, even if it is only the show biz side of things. "Flying a spaceship here is absolutely insane!" Meanwhile the real Captain Marika and the real Bentenmaru are exploring a very rough part of space. I loved this section for a couple of reasons. First this was the first time that Luca has shown any emotion. She was clearly not happy about having to navigate through that mess. Second, this was a good way of developing the setting; sailing through rough waters in a ship through a storm definitely gives some of the feeling of a pirate yarn. 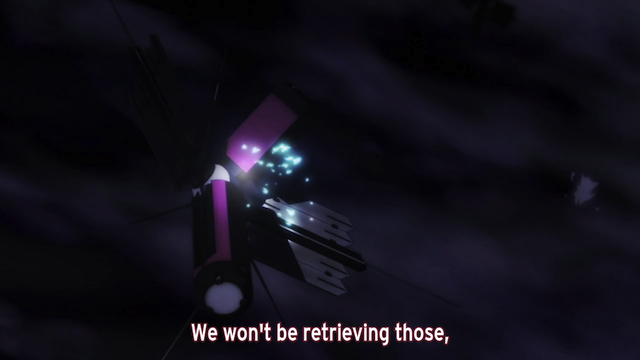 Another interesting part of this was that we got to see some more technical details, in this case the Bentenmaru carries some finite amount of deployable probes. Unfortunately, due to the difficult conditions, dispersing them here means they will be unrecoverable. 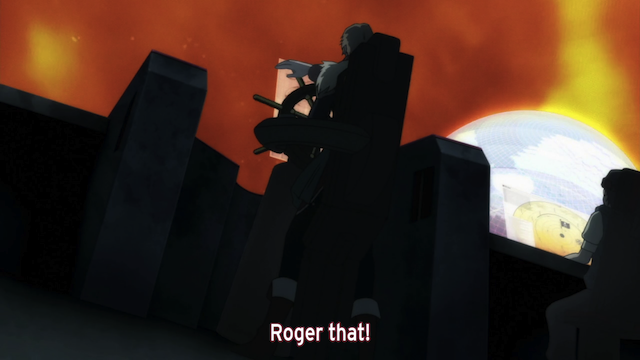 Some may think this was a minor part of the episode, but I want to emphasize it because I think it is a good example of the quality of the writing in B-Pirates. The probe scene was important for the story in three different ways. First in terms of setting, both the demonstration of technological aspects of the world that gives this series a “hard SF” edge, and the demonstration of the stormy sea through which the Bentenmaru is sailing (that is the evocation of a nautical yarn). Second, the situation was used to show us more about Princess Gruier Serenity’s character. In this case she felt sorry for what she was putting the crew through, so she offered to reimburse them for the probes, which was empathetic, but missed the strategic importance (they might run out of probes on the journey, and thus have a harder time looking for the Ghost Ship). Finally the probe scene was used to lead us along the plot, as I’ll explain next. 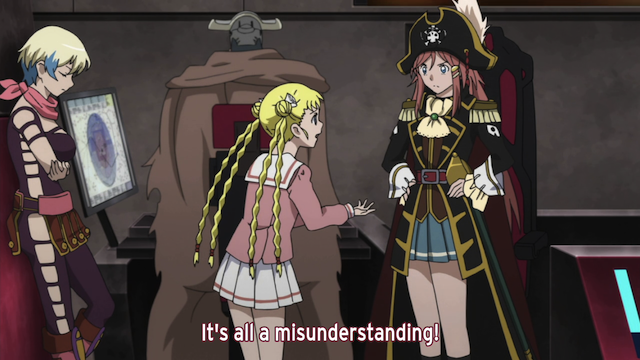 Marika, Gruier, and Coorie discuss the situation. When Marika and Gruier wake up the next morning, they find that the bridge crew has pulled an all-nighter after finding a network of probes left over from previous search parties. Having discussed the need for probes in their search, we now have a whole network of them, but Coorie’s ability to access the probe network points to a new mystery: the key she used was Princess Gruier herself. She submitted information on the princess (name and biometrics), and it was accepted — despite the fact that the network was put in place years before Gruier was even born. Coorie at her workstation. "The royal family must really be special." So the princess herself is a biological passcode, and the exact information in her genetic makeup was known years before her birth. The princess makes a cryptic comment about the royal family being able maintain Serenity’s independence. We have already seen several oddities associated with the princess, such as her ability to sneak onto the ship, and her ability to get a secret message back to her home planet. None of this has been explained. Special indeed. Luca. So her face is capable of showing emotion. The network of probes detects the presence of the ghost ship, so the bridge crew scrambles back to their stations. 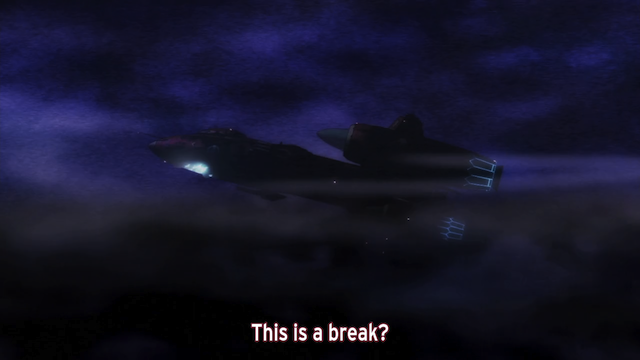 Further a fleet of battle-class space ships is spotted, so Marika asks Schnitzer to prepare for hostilities. The Bentenmaru. FTL travel through choppy seas. Unfortunately the chase doesn’t go well. 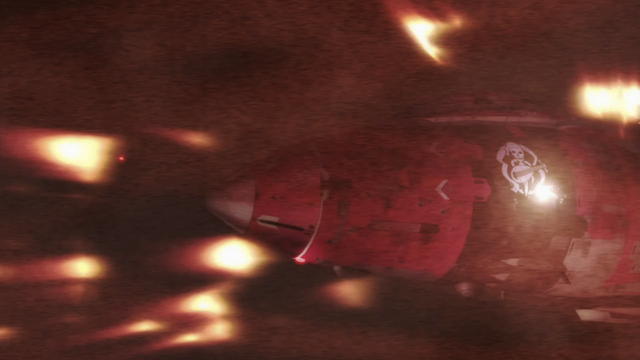 Some anti-matter missiles were fired to clear the passage as they came out of hyperspace, but the missiles collided with the ship, causing damage to their hull. Also, the Golden Ghost isn’t where they had anticipated. And to top it off the fleet of ships has detected them and is giving pursuit. The different reactions of the bridge crew was very interesting. Kane seemed to be having fun, steering the ship. Marika looked like she was having a good time as well. Sandaime, the one responsible for ship systems (and, seemingly, hull integrity) was panicking. Misa calmly adjusted the headrest on her chair. The ships in the enemy fleet have split up, so Marika boldly attacks the smallest and closest group. 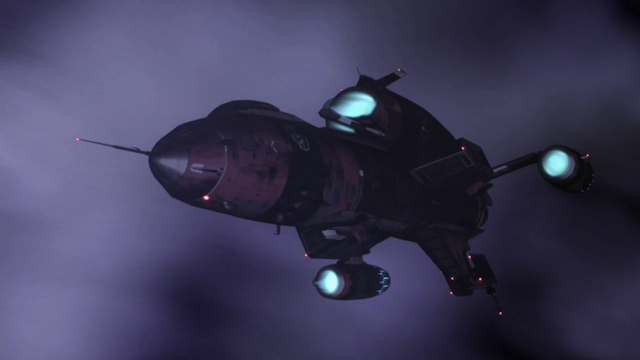 Further they make an unusual move by flying right between the two ships, thus intentionally entering both of their fields of fire. 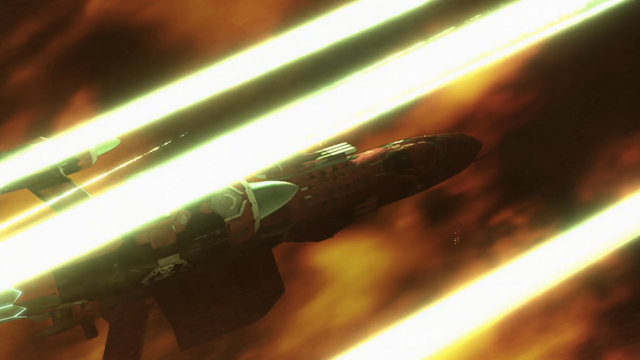 The surprise attack knocks out the sensor systems on the two ships, and the Bentenmaru retreats, but they discover that the ships are, in fact, from the Serenity Stellar Monarchy. 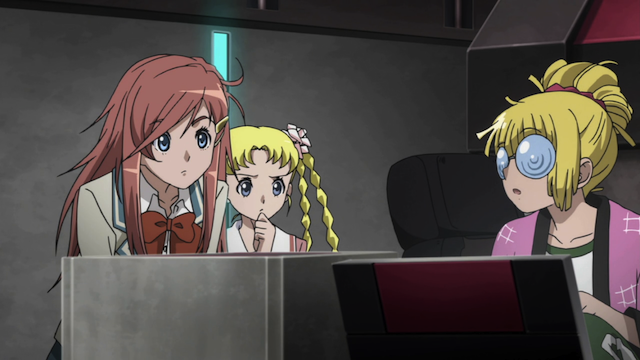 Misa Grandwood, Princess Gruier Serenity, and Captain Marika Katou. Princess Serenity pleads with Captain Marika to let her talk to the ships and have them stand down, but Marika refuses, saying her presence is a trump card they need to hold in reserve. The rest of the crew was clearly waiting to see how Marika would handle Gruier’s request, and they seemed quite pleased with the outcome. Marika showed resolve, and concern for the dangerous situation they were in, as well as an awareness that they need to plan ahead. Marika really is the best lead character of the Winter Season, perhaps with the exception of Natsume (who did already have 3 seasons of build-up). When I first saw the promo image for this series, I really feared that she’d be another moe blob, but the contrary has really happened. I’m not one for picking “bests” of anything, but I do think Marika has come a long way from the clumsy airhead she seemed to be at the start of the series. They have gone out of their way to show her in learning situations, as well as situations like this, in which she is decisive and has good reasons to back that decision up. Although the Bentenmaru didn’t find the Golden Ghost Ship this week, they did come close, the tension was ratcheted up, and we got some mysterious information about the Serenity royal family. 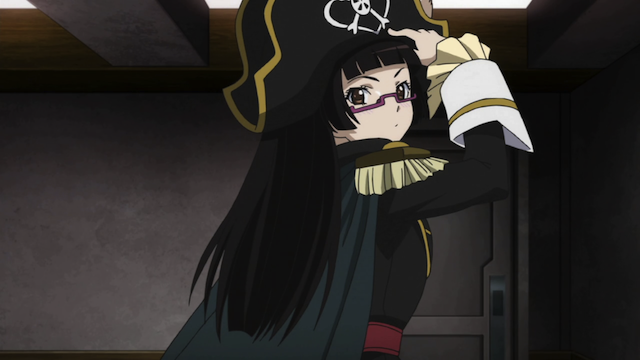 Chiaki Kurihara in pirate garb. Sandaime tells it like it is. In addition to the larger, probably important points you discussed, there were a lot of little things about this episode I enjoyed. I really liked seeing a pirate attack from the viewpoint of the “victim.” The Captain’s comments about the “professionalism” of the pirates was very funny. I loved the work-hours shift limitation for underage employees. Captains and Princesses NOT exempt. That was a HOOT! I also thought that the old-style wood beam look of Marika’s and Gruier’s rooms was neat. And it seemed to say something about the way these people feel about what they’re doing. They seem to genuinely honor the tradition they’re a part of. Those are all good points. I just can’t talk about everything that is handled well in a show like this. If I were to pick one of the three points you raised, it would have been the wood beams, that creaked as the ship continued its journey through the storm, because I thought it was another good example of how this episode created the atmosphere of a nautical yarn (which generally includes pirate stories). Wow! This was just a fantastic episode filled with lots of surprise things thrown at us! 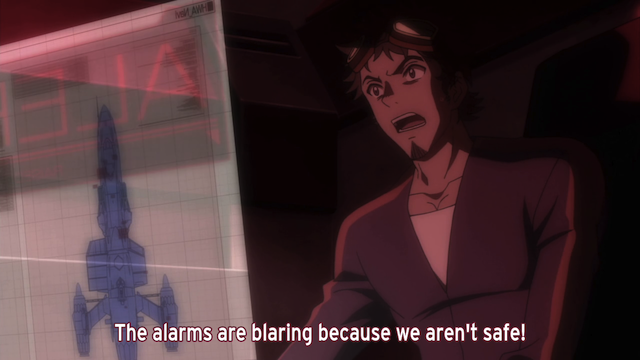 Like Chiaki acting like the captain of the Bentenmaru? AMAZING! I loved that she actually got into the role after she mentioned she would never do such things. Yeah, I liked the sounds of the boat, as well. The ship looks great. I suppose 3D stuff looks better when you don’t have to mix people into the shots. I’m excited to see where things go from here. Although I’m a bit iffy on the technical aspects of the ship travelling faster-than-light (if it’s travelling faster-than-light, why would radar work? why don’t they hit asteroids? why would interstellar dust be visible? and of course – why is there sound in space? ), I do like your points that explain why these might be non-issues: they probably do have the technology to make light travel faster-than-light in the future and to propel asteroids away from the path of the ship; even if they didn’t, this episode sure was a great way to infuse some good ol’ fashioned pirate flavour into the show; and finally, the characters are really the true stars of the show. Pun intended, but not very obviously. I don’t think they were using radar during the jump. They were using the sensor probes and then jumped to the site where they thought the Golden Ghost was. Then they used radar in “normal space” (that is, while traveling slower-than-light). As far as I know, they haven’t explained their means for achieving FTL speeds. I don’t know why they don’t hit objets while traveling FTL, but it looks like they can have problems with objects in normal space while dropping out of FTL travel (thus their use of anti-matter missiles).